The Pinball Resource Collection Of Books, Newsletter, and Videos to Educate and Entertain The Pinball Collector! This is the only printed Pinball Price Guide! This is the old Larry Biezia's price guide taken over and updated by Pinballeric™. 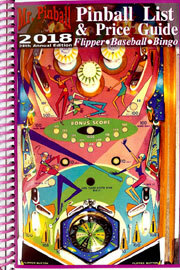 This book covers pinball machines, starting in 1931 through 2012, including pinball games before flippers were invented! It has 3 different pricing classes for each pinball machine! The books is a great reference for the Pinball Collectors and has a wealth of information, too much to cover in this short description! If you want to know what your game is worth or how much your should sell your game for(Collectors don't sell games do they? ), this is the book for you! Did you ever wonder what your Pinball machine is worth. Are you looking for a price guide to tell if the machine you saw listed on EBAY is too much. The Pinball Resource sells all the latest and greatest price guides! manufacturer, and includes release date, game features, production numbers, current value, and price trends. The book is comprehensive, including well over 2,900 games (1947-2018), from 248 manufacturers, both US and foreign. guide for anyone interested in pinball or its related arcade cousins. The Standard Version (print) is a handy 5.5"x8.5" size, and is coil bound to lay flat. By Gordon Hasse, JR. and Steve Young. Did you know in 1982 that Steve Young produced a quarterly newsletter called The Pinball Collectors Quarterly? This newsletter was produced for 4 full issues. It contained fantastic black and white artwork, stories by famous pinball historians, ads of the times, fun facts, tips, want ads, illustrations, and much more pinball stuff. This makes great bathroom or coffee table reading. It will take you back when the great pinball companies where still producing their greatest games. The price for the set of 4 has remained the same since 1982, it's only $20.00 for a copy of the original set. 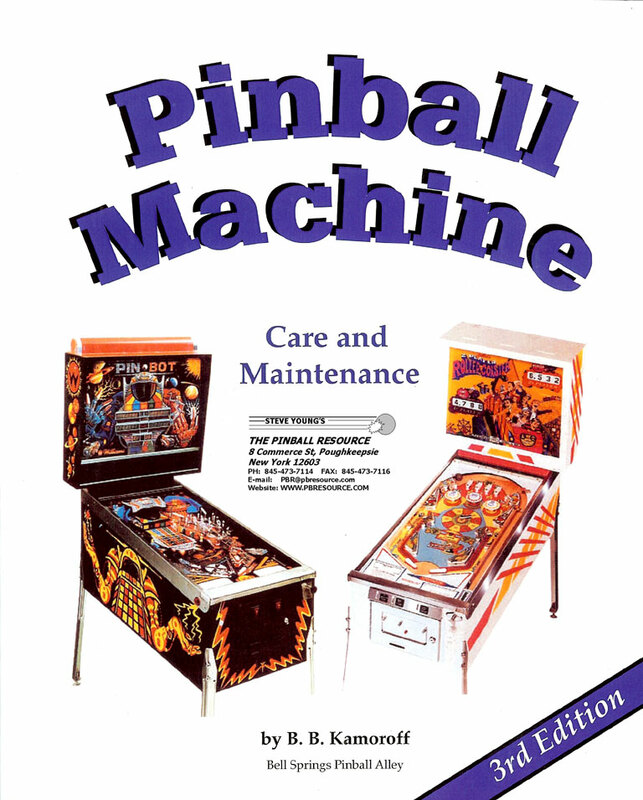 This updated book fills a void of information for a new pinball owner or someone thinking about buying a game. This is a 216 page bound book, it helps you in choosing and buying a pinball machine. It will teach you about transporting the game, setting it up, adjustments, cleaning and maintenance, free play setup, trouble shooting problems, and much more. This book sells for $28.95. Planning on repairing your own Multi-Player game? This spiral bound book covers the repair and maintenance of Electro-Mechanical Multi-Player Pinball Machines from 1960-1977. This book contains many tips and hints for the amateur. It has clear explanations with many schedules and illustrations. It provides step by step repair and replacement of components, with little knowledge of electronics required. It contains repairs for Bally, Williams, and Gottlieb® machines. This books is not applicable to single player games. This book contains 195 pages. The book sells for $37.95! This NOS parts catalog contain major assemblies breakdowns by part number, printed Circuit Boards, playfield parts, Technical Service Bulletins, cabinet information, plus a whole lot more for the above games! It contain major assemblies breakdowns by part number, circuit board information, playfield parts, coin entrance parts, cabinet information, plus a whole lot more for the above games! This is a spiral bound copy of the Gottlieb® 1980' Service Manual. It contains complete data on System 80 games. This edition includes special revision pages. This manual is 60 pages. 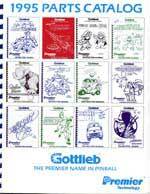 This is a spiral bound copy of the Gottlieb® Service Manual. It contains complete schematics for Gottlieb System 1 games. This 2nd edition includes special revision pages. This spiral bound copy of the parts catalog contain major assemblies breakdowns by part number, disc and wiper information, playfield parts, coin entrance parts, cabinet information, plus a whole lot more for the above games! This spiral bound reprint of the parts catalog contain major assemblies breakdowns by part number, disc and wiper information, playfield parts, coin entrance parts, cabinet information, plus a whole lot more for the above games! This re-printed catalog illustrates parts and assemblies used on 54 Gottlieb® games, from Niagara (11/50) to Sea Belles (8/56). It includes adjustments and lubrication instructions along with parts lists.